Aww the Enzo. The car that I consider to perfectly define a supercar. This is the car I grew up with on my bedroom wall, and one of the cars I remember very well from my youth. It at the time was a pinnacle of engineering, and it still is today 12 years later. 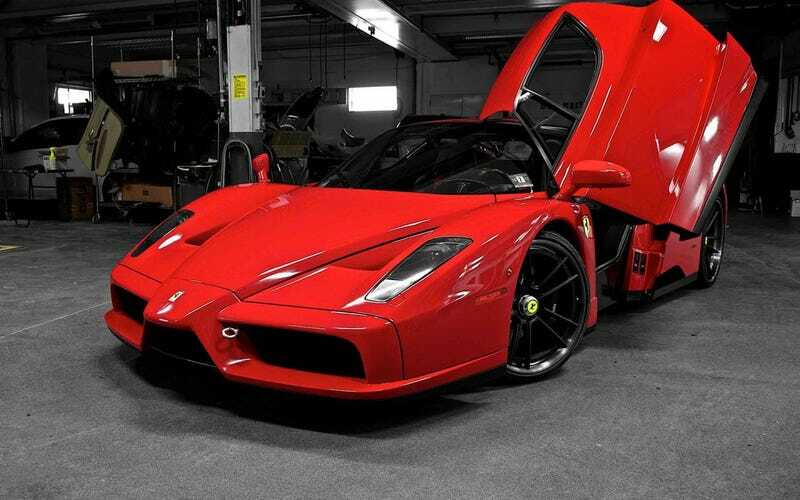 Now the Enzo is a car of many numbers. 6.0L V12 making 651 hp at 7,800 RPM, and 485 lb ft at 5,500 RPM with a 8,000 RPM redline. Its original price of $659,330 is now nothing compared to usual trade price of 1 million+. 0-60 came in 3.2 Seconds, and it had a top speed upwards of 220 MPH. In essence it was a super car in every way. Terrible teen-numbers of MPG, and completely impractical for anything more than a track day, or a Sunday drive. It was stripped out road going racer, which later became the platform for the Ferrari FXX, and the Maserati MC12. I would do the same wouldn't you? Images: I take no credit for the images, but Google images has provided them for our needs. Tell me what you guys think? Series yes/no?